I always understood Quincy Jones as an exceptionally important figure in the entertainment industry, but I couldn’t actually tell you why. All I knew was that he was a big deal in the music world, everyone loved him and wanted to work with him, and the younger generation lovingly called him Uncle Q. So as a person with only a surface knowledge of the greatness that is Mr. Jones, the recent Netflix documentary, Quincy, served as a much needed history lesson on one of the most dynamic, amorphous, talented creators of the last two centuries. Directed and partially filmed by his actor-daughter, Rashida Jones, the film serves as a blend of his personal and professional life. In a loosely linear fashion the viewers follow his journey from a poor black child on the Southside of Chicago to a world renowned music producer, an inspiring thing to witness. In attempt to grab ahold of the accomplishments in his 70 years in the game coupled with my awe, I have listed a few of my takeaways. Uncle Q is one tough dude with an unparalleled work ethic. At age 41, he collapsed at home after working tirelessly for months on end. His partner at the time, Peggy Lipton – mother of Kidada and Rashida, called 911 and he was rushed to the hospital where it was discovered that he had a brain aneurysm. Doctors gave him a 1 in 100 chance of survival. Jones survived his first brain operation to learn that in the next two months he would have to endure it again as doctors discovered another aneurysm on the other side. Post-surgery, the artist suffered from dropouts in memory, had to learn to write again as his straight lines had turned jagged, and was told he could no longer play the trumpet. This was more than forty years ago and Jones had an amazing recovery nonetheless, living on to become one of the most decorated and versatile artists to date. He also had to wrestle with his emotional trauma. His mother, a brilliant woman who struggled with mental illness during a time where she was declared insane, was thrown into an asylum when Quincy was just a little boy. He was able to redevelop a relationship with her before she passed, but consistently struggled with the nature of her mental illness and the fear that it might also be present in him. The childhood trauma of fearing his mother combined with the challenges of growing up dirt poor and thus admiring the gangsters, is what fueled his work ethic. What is also interesting is that he reached a point in his life where he recognized that his work was a method of running for fear that stopping would somehow mean death. Upon this revelation, Jones began to slow down and spend more time with his family. Jones willingness to discuss the motivation behind his work ethic as well as the challenges he faced in balancing his work and personal life, serve as a reminder for us to reflect and check-in with ourselves to see if we are carrying hindering survival skills into our season of thriving. He actually wrote music – like scores. Jones who got his start playing the trumpet in the big bands of 50s, composed original music. He was good friends with Ray Charles, arranged music for jazz greats like Sarah Vaughan, Dinah Washington, and Duke Ellington. Jones even had the opportunity to live overseas where he formed his own orchestra. Upon returning to the States, among many other projects, he eventually moved into scoring music for Hollywood films. He became the first African American to be nominated for an Oscar for best original score as well as the first African American to conduct the Oscar orchestra. In one of the first few scenes of the documentary he explains to his daughter, Rashida, his preference for writing at night as that was when “the muses came out.” In short, Jones is genius. But the depth of his brilliance is probably only news to me; I’m sure you already knew that. His longevity and relevance result from his ability to adapt. Uncle Q has gone from playing trumpet, to writing music scores, directing iconic music videos, executive producing films, founding VIBE magazine, mentoring up-and-coming artists, developing humanitarian efforts and so much more. He has learned to meld his talent and drive with the times and in doing so, remains relevant. He is not only respected and admired by younger generations for his contributions to the industry, but for the way he talks to them and not at them. In the documentary it was especially heartwarming to watch the way he conversed and interacted with more contemporary musical stars like Dr. Dre and Kendrick Lamar. His humility and his ability to mobilize a connection with artists based on their art and not their age is admirable. I see why he is Uncle Q. 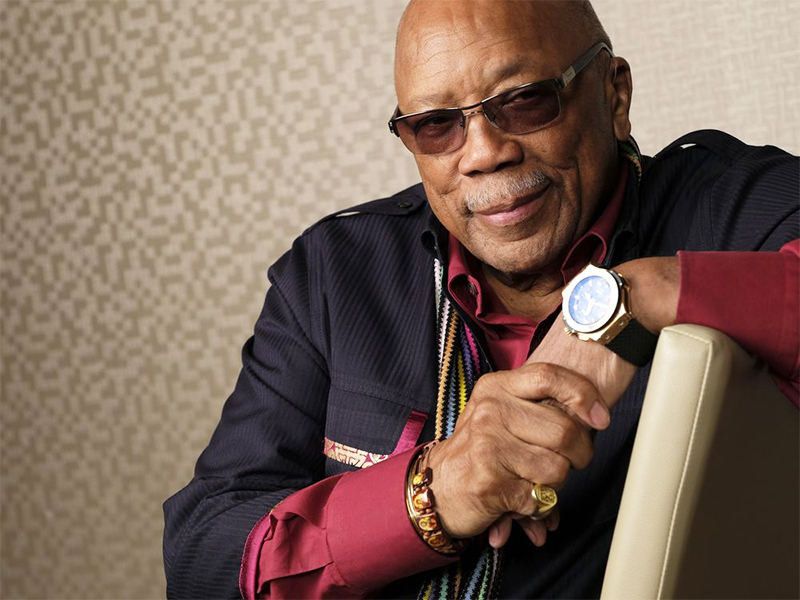 One can only dream of accomplishing a sliver of what Quincy Jones has been able to do in his lifetime. Nevertheless, his work ethic, charm, and adaptability are not only aspirational but encouraging. Through his openness and his willingness to reflect on his life, viewers are reminded to be mindful, seek balance, and enjoy the ride.